So even though the dinner is simple and easy, there has to be variety when it comes to taste. Hubby dear is extremely difficult to please when it comes to food. For past two days he had been telling me to prepare some chaat at home and i kept declining the offer thinking, it requires so much of preparation. 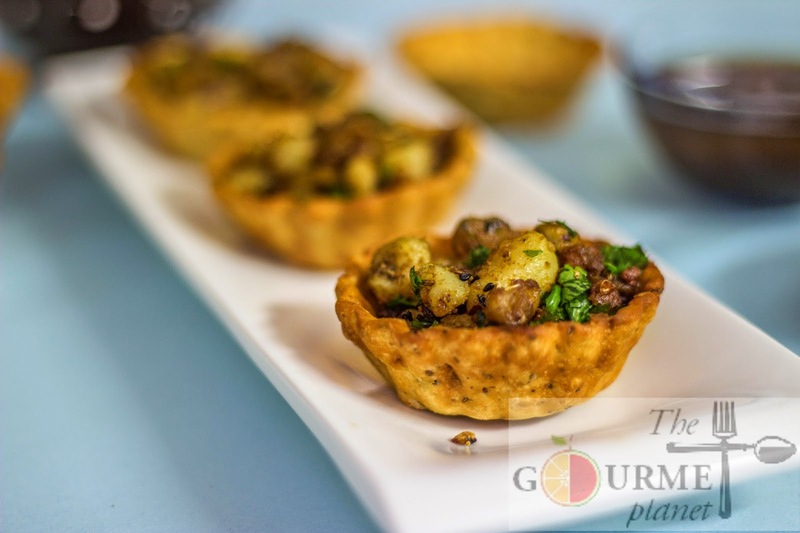 Just when i was thinking over his chaat proposal and looking for something less extensive and elaborated for a weekday, i was struck with this recipe of potato nests. Trust me, initially it was just a random thought and further contemplation made me draft the complete recipe. Yesterday, i decided to surprise my darling hubby with a stylish new twist to the traditional chaat. Oh yes! I am the innovation queen and for me its a big NO NO to follow a recipe as it is. A twist is my signature style to any dish. So before hubby was back home, i began with the preparation. Easy peasy steps and easily available ingredients made my tasks a cakewalk! 20 minutes of kitchen work and all was set and served :) My Mr.Tripathi entered the home sniffing around, enjoying the aromas and looked happy conjecturing that wifey had made something special for him. He knows me too well! Mr. Husband was right! His eyes gleamed at the site of the pretty little nests that were waiting to get devoured. First bite and his eyes said it all. He looked spell bound and later confessed that he overate BIG TIME!! :) No wonder, he always blames me for his cute little bloated tummy :P Nevertheless, for me that growing belly is a sign of happiness and contentment! 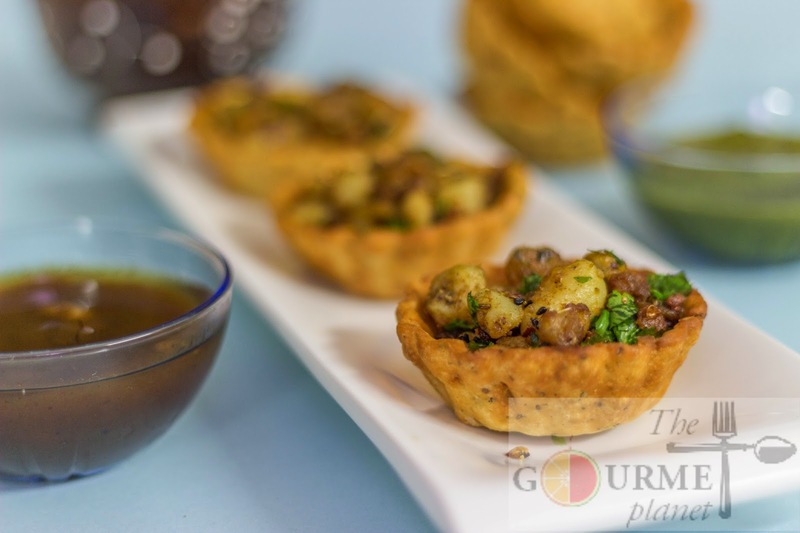 So here's how you make a contemporary chaat or a tangy starter! Combine all the ingredients and knead it to a stiff dough. Once done, let it rest for 15-20 mins while you prepare the stuffing. 4. Now add nigella seeds, fennel seeds and coriander seeds and red chilli flakes. 3. Let the spice splutter for a while and then add broken potatoes and saute them on medium-high flame. NOTE: Since the potatoes need to be crisp and browned well, hence the medium-high flame recommended. Ensure, while the flame is high, you continuously toss the mixture else all will burn. NOTE: The mixture needs to be tangy, so you may increase or decrease the chaat masala according to the sourness required by you. 7. Keep tossing on medium-high flame until the potatoes look crispy and well browned. Blend all the ingredients mentioned for green chutney and squeeze in the lemon juice once all has blended well. 1. Place a wok on the gas stove and let it warm up. 2. Pour in the tamarind pulp in the wok and let it come to a boil. 3. Bring down the flame to medium and now add roasted cumin seeds powder, sugar, ginger julienne, red chilli powder and kishmish and salt as per taste. 5. When cooled, store the saunth chutney in an air-tight dry jar or container. 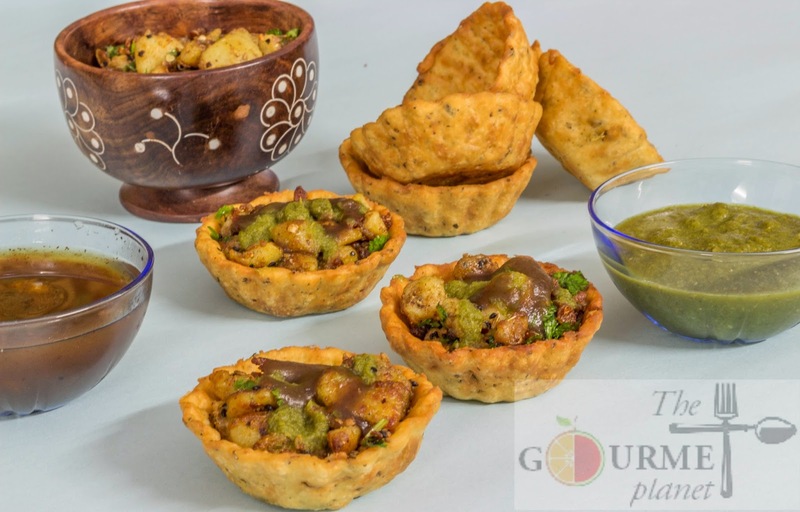 refrigerate and serve the sonth chutney whenever required with chaat or snacks. 3. Use your fingers to press the rolled chapati on the mould letting it take the shape of the utensil. 4. Press it hard and ensure there is no air passage anywhere. 5. Trim the excess dough from the rim of the moulds. 7. Heat oil in a wok and deep fry the nests in the oil. NOTE: When you are deep frying, you have to add the muffin mould( which has the dough stuck to it still) into the oil. 9. Once the top surface of the nest is cooked, flip the mould and it will automatically leave the dough and you can fish it out of the oil then. 10. Now fry the nests in the oil just like mathris with flame switching between medium and high. 11. One the nests are light brown in color, take them out of the oil and transfer to a kitchen towel. 12. Make the nests from the remaining dough following the above steps and let the nests cool for sometime before final assembly. 13. Arrange the nests on a platter and add potato mixture till the level of rim. 14. Put some green chutney and sonth on top and serve.